Vladimir Putin’s first year in his latest term as president has been highly eventful. Here is a look at the most notable facts and quotations of the past 12 months. The first year of Vladimir Putin’s third presidential term was full of events: unexpected resignations, a flood in Krymsk with an unprecedented number of victims, the first Russian APEC summit and the outstanding achievements of the Russian Olympic team. The head of state also continued a number of traditions, having resumed the practice of high-profile news conferences and question and answer sessions. In his first day in office, President Putin signed a number of executive orders on the long-term development of the system of public management, the army and the economic and social sphere, including education, science, healthcare, demography and utilities and also the implementation of foreign policy. These documents were based on Putin’s election program. Their implementation was declared a priority in the activities of the president and the government, which was formed in the latter half of May. “Today we are entering a new stage in our national development and we’ll have to resolve issues of an entirely new level, quality and scale. The next few years will be decisive for Russia for decades ahead,” Putin said at his inauguration. The first summer month saw the president be active on the international arena, both in the East and the West. During this time Putin visited Germany, France, Uzbekistan, Kazakhstan, Israel and Palestine. He also attended the summits of the Shanghai Cooperation Organization (SCO) in China and the G20 in Mexico City, where he met US President Barack Obama as head of state for the first time. The conversation with the American leader created hope that the idea of a “reset” was still alive and that the two powers will be able to agree on all key issues. The catastrophic flooding in the Krasnodar Region – in which about 170 lives were lost – and dealing with its aftermath were the president’s priority for a long time. He visited Krymsk to hold meetings on providing aid to the victims in July and subsequent months. As Putin promised, people were able to move into new housing by the winter. “There will be new housing. I assure you, your new homes will be much better, you’ll like them 100 percent,” Putin said at the meeting with residents of the Kuban region who lost their homes in the flooding. A fan of sports in general and judo in particular, Putin used his working visit to Britain as a good opportunity to attend the Olympic Games. Upon the completion of official talks, the Russian President and British Prime Minister David Cameron watched the semi-finals and finals in judo and witnessed the triumph of Russian fighter Tagir Khaibulayev, who won a gold medal. “This is probably the best result in the history of Russian and Soviet sports. We haven’t achieved a result like this before,” Putin said at the meeting with judo fighters. September was marked by many events for the president. At the beginning of the month he took part in an experiment to save a rare species of crane: the Siberian white crane. He led young birds on a delta plane, teaching them to fly away for the winter. In late September, Putin reviewed the government’s implementation of presidential directives given in May. The president had to resort to tough measures on this score and made official reprimands to Labour and Social Development Minister Maxim Topilin, Education and Science Minister Dmitry Livanov and Regional Development Minister Oleg Govorun. On October 17, Putin forced Regional Development Minister Oleg Govorun to resign and appointed Igor Slyunyayev, the ex-governor of the Kostroma Region to the position. This was the first personnel decision during the work of Dmitry Medvedev’s government. “The work of any minister involves personal responsibility for the performance of the industry. 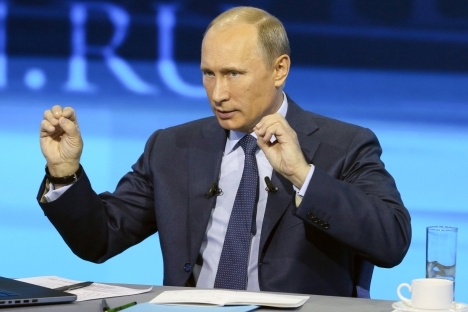 If something is not done, he or she must bear personal responsibility for this,” Putin said. The second resignation took place less than a month later. On November 6, Putin dismissed Defence Minister Anatoly Serdyukov from his position against the backdrop of a scandal over large-scale embezzlement in the companies subordinate to his ministry. Serdyukov had occupied the position since 2007. Putin appointed former Emergencies Minister Sergei Shoigu, who was the governor of the Moscow Region at that time, to head the Defence Ministry, and endorsed Andrei Vorobyev, the leader of the United Russia parliamentary party, as acting governor of the Moscow Region. December was marked by two meaningful events in the life of the marine fleet and the navy. First Putin took part in the name-giving ceremony of the head supplier ice-breaker Vitus Bering in St. Petersburg, and then he visited the base of the Northern Fleet in Severomorsk, where he presented the Nakhimov Order to the heavy nuclear-powered cruiser Pyotr Veliky. The president listened via a video link with Severodvinsk to a report by Defence Minister Shoigu on the long-awaited commissioning of the nuclear-powered missile cruiser Yuri Dolgoruky. In February, the president made a number of tough statements. He lashed out at utility workers who had jacked up prices and the builders of the Olympic projects that had delayed preparations for the Games. The recently appointed Minister of Regional Development Igor Slyunyayev had to answer for the former. In Sochi, Putin lashed out at vice president of the Russian Olympic Committee Akhmed Bilalov. His company was building several springboards named The Russian Hills and didn’t meet the deadline or budget limitations. Later, the businessman was forced to resign. Spontaneous military exercises in March reflected the president’s idea that the combat training of troops should not just be for show. On the way from South Africa where Putin attended a BRICS summit, he ordered the defence minister from the plane at 4 a.m. to start exercises involving aviation, the fleet and about 7,000 personnel.